April | 2012 | What Next? He’s looking pretty good but he needs a companion! Last week on one of my walks I spent some time looking at the Golden Boy statue which sits atop the Manitoba Legislative Building on Broadway in Winnipeg. I saw the statue up close and personal in 2002. The statue had been taken down because it needed to be repaired and regilded. It was put on display in the foyer of the Manitoba Museum, at that time still called The Museum of Man and Nature. Thousands of people came to look at the statue and have their picture taken with it. I was so close to the Golden Boy I could have touched it. It was definitely in need of a touch up since it had turned a sort of rusty green. It was covered with tags at the spots where repair work needed to take place. The Golden Boy was created by Georges Gardet at a foundry in Paris. The foundry was destroyed by bombs during World War I, but the Golden Boy somehow emerged from the ruins unscathed, was rushed to a seaport and loaded onto a French vessel carrying wheat. The liner was quickly commandeered to transport military troops. For the next while, the Golden Boy cruised the dangerous war time ocean waters in the ship’s hold. When the fighting was over in 1919 the statue was taken to Halifax and from there shipped to Winnipeg. The Golden Boy was purchased along with the two huge bison figures at the base of the legislative building’s main stairway, for a bargain price of $11,000. Now the statue is insured for more than fifteen times that amount, and just over one million dollars was spent restoring it to its former glory in 2002. The Golden Boy is actually a nickname for the statue who is officially called Eternal Youth. Apparently once placed in his high spot, the sun glinted off his bronze covering, creating a certain golden effect. Thus he earned the title Golden Boy. The torch in his right hand is supposed to represent a call to youth to join the pursuit of a more prosperous future for Manitoba. It’s a lofty ideal, but I couldn’t help thinking as I viewed the statue, that the female half of our province’s population has been somewhat slighted. Young woman have just as important a contribution to make to Manitoba’s future as young men do. Perhaps we need a Golden Girl to join the Golden Boy atop the Legislative Buildings. So says Molly Peacock the author of the biography The Paper Garden which tells the story of Mary Delany who at age 72 invented a new art form–mixed media collage and in the next decade created nearly a thousand botanically correct beautifully cut paper flowers. When her second husband died Mary began making flower mosaics as a way to deal with her grief. Her flowers are exceptional because of their detail. Each chapter of Molly Peacock’s book begins with a full-page flower illustration. Molly has carefully picked the flowers so they correspond with the period of Mary’s life that is described in that chapter. In each chapter as well Molly tells us a little bit about her own life and how it relates to Mary’s life and to the flower that has been chosen for that chapter. She has “cut the silhouette of another’s existence and placed it against her own.” Besides learning about Mary’s life and Molly’s life we also learn about the life of Ruth Hayden, Mary’s first biographer who published a book about Mary and her flowers in 1980. We know so much about Mary’s life because she wrote hundreds of letters to her sister Anne, who saved them all. A descendant of Anne’s published the letters and they sparked lots of interest in Mary’s life and work. Molly Peacock’s book is full of exquisite descriptions and many phrases that really get you thinking. Molly Peacock says Mary encourages us to look for artists of the everyday– grocers who arrange their produce in attractive and colorful ways- people who dress in an interesting and artistic style–even people who hang out their laundry in a definite pattern or order. My friend Esther recommended The Paper Garden to me and I throughly enjoyed it ! I rationed myself to read only one chapter a day so I could savor the beauty of the words, the flowers and the ideas in that chapter. 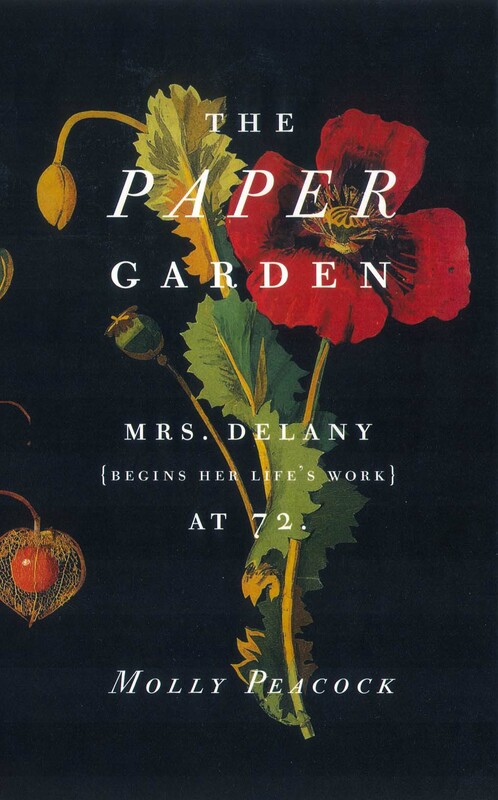 I think the main reason I liked this book so much is its subtitle which reads Mrs. Delany Begins Her Life’s Work at 72. It made me think that there are still things I can achieve and learn since I’m more than a decade younger than Mary Delany was when she began her life’s work. Two of my favorite quotes from the book reflect this………. We didn’t have Mr. Rogers or Big Bird or Sponge Bob or Fred Penner when I was growing up. We had Aunt Olly. Olly Penner hosted a program on the radio station CFAM for kids called Children’s Party and I was a devoted fan in my childhood. Like many families in the late 1950’s and early 1960’s we didn’t have a television and along with thousands of other children from all over western Canada and the central northern United States I sat near the radio every afternoon while Aunt Olly read stories like Tall Fireman Paul, Big Red and Nikki Nikki Timbo No So Rimbo and played funny songs like I Know An Old Lady Who Swallowed A Fly. If your mother sent in a request, Aunt Olly would also wish you a Happy Birthday over the air and even tell you where your Mom had hidden your present. In 1989 I was given an assignment to write a feature story about Olly Penner for a magazine and so I had the chance to interview my childhood idol. 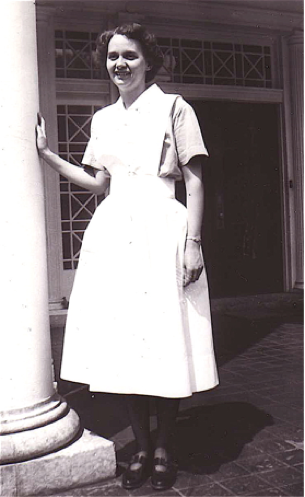 I found out that not only had she done a children’s program for CFAM she had also hosted a variety of other shows like Ladies First, Hints for Homemakers, The Garden Show and Social Calendar. She co-hosted the radio station’s morning show with anchor Jim McSweeny for 13 years. All this in a time when most women did not work outside the home, something she was criticized for by some radio listeners. 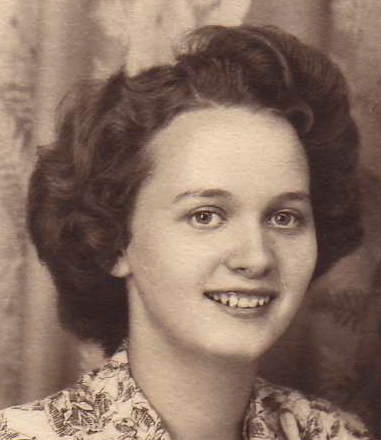 She said the support of her husband Vic who was a newspaper editor but was often referred to by the public as ‘Aunt Olly’s husband’, made it possible for her to keep up with all her radio station commitments which included many public appearances. She also found time to write a regular newspaper column, publish a cook book, and be an active participant in several community organizations, all while raising two sons. The day I interviewed her she showed me the thousands of fan letters she had received from children. Many had sent her photographs and drawings. But she also had fan mail from adults; grandparents who enjoyed her show, farmers who listened to her while driving their tractors, recent immigrants who said they were learning English by listening to her and parents who said they got their children to behave by threatening to take away the privilege of listening to Children’s Party. She even had a fan letter from a priest who said he’d ‘fallen in love with her voice’. Olly retired in 1987 and when I interviewed her in 1989 she was already a grandmother and enjoying traveling with her husband and spending more time with her family. Olly Penner had a legion of fans in a time when media programming aimed specifically at children was a rarity. I wonder if anyone else remembers listening to Aunt Olly? pet peeve ……..a minor annoyance that an individual identifies as particularly irritating to him or her, to a greater degree than others may find it. pet praises- a minor event that an individual identifies as particularly pleasing to him or her, to a greater degree than others may find it. Next month my Mom and Dad will celebrate 60 years of marriage. 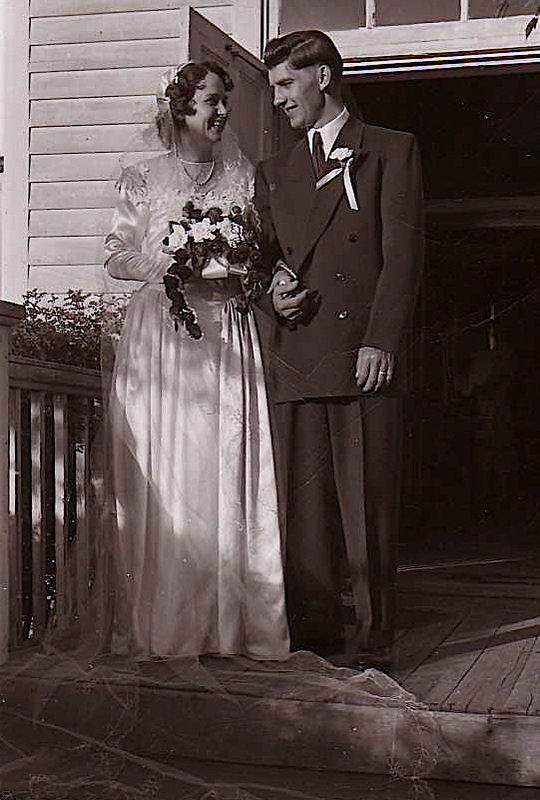 I’ve spent quite a bit of time in recent weeks compiling their life story in photos to share at their anniversary party. One section of the presentation is about their courtship. 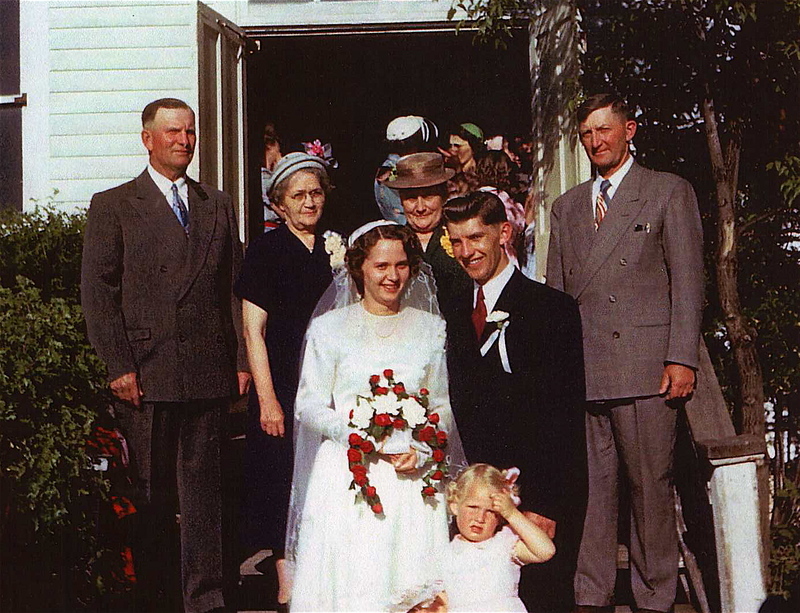 Mom and Dad met each other when they were students at Canadian Mennonite Bible College (now Canadian Mennonite University) in 1950. 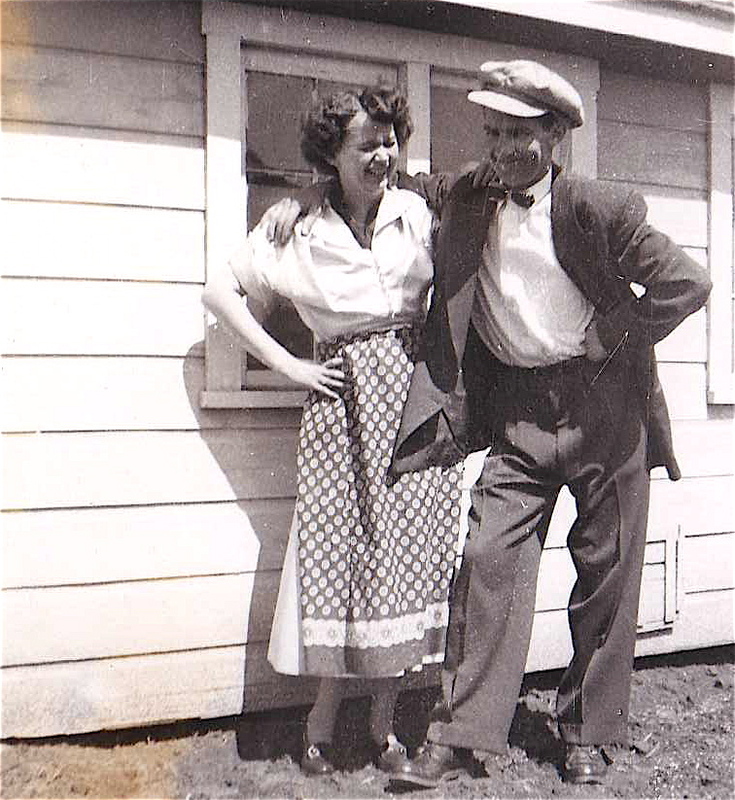 Mom came to college from her parents’ farm just outside of Drake, Saskatchewan and Dad from his parents’ farm in Gnadenthal, Manitoba. Both Mom and Dad had been teaching public school for a couple of years to save up enough money for college. They were on the college student council together. 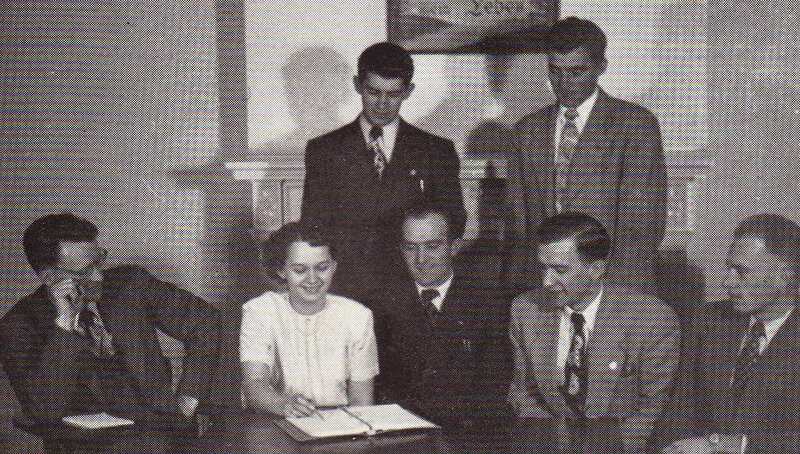 Mom is the secretary and Dad is standing and leaning over her shoulder. 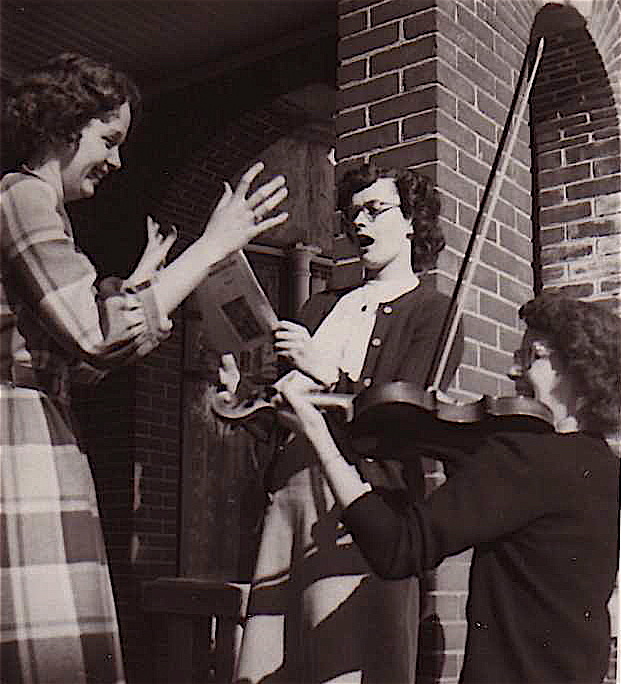 Mom shown here conducting some of her fellow students was very involved in music at college. She played violin and piano and sang in an octet that went touring around the country giving concerts in various churches. Dad was on all kinds of committees. 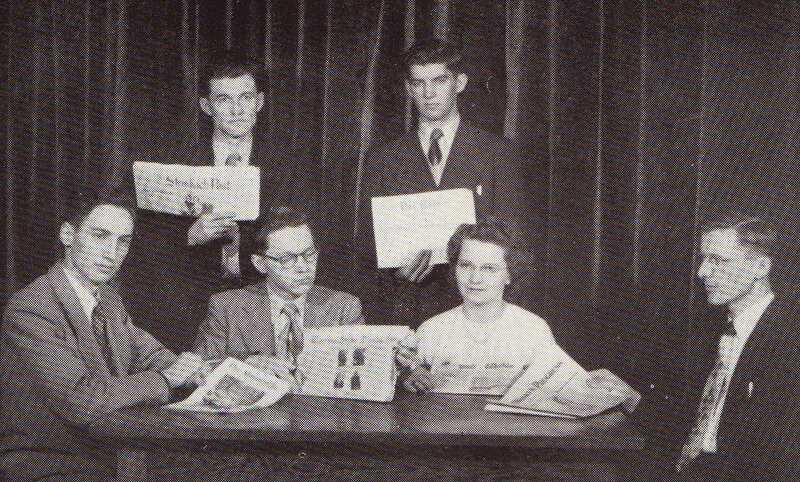 He was a member of the literary society, organized community socials and is shown here standing in the back row on the right holding a copy of the school newspaper which he helped to publish. 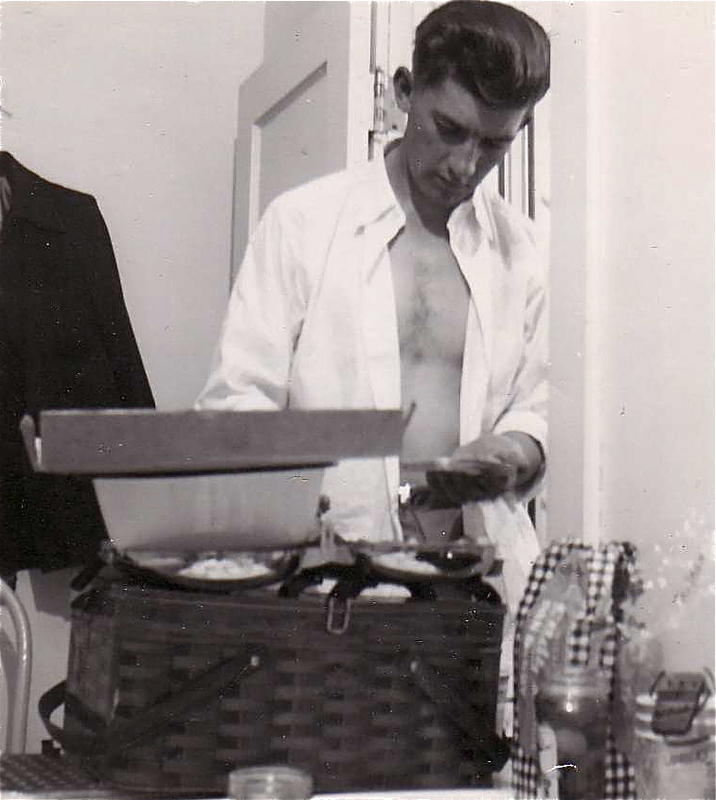 Mom says she was attracted to Dad because he had such a good sense of humor and made her laugh. He was also very popular with his classmates. Dad says he was attracted to Mom because she was so pretty and he admired her musical talents. He also liked it that she came from a close family like he did. On their first date they went bowling and then to a coffee shop on Broadway with their friends Irma and Norman. 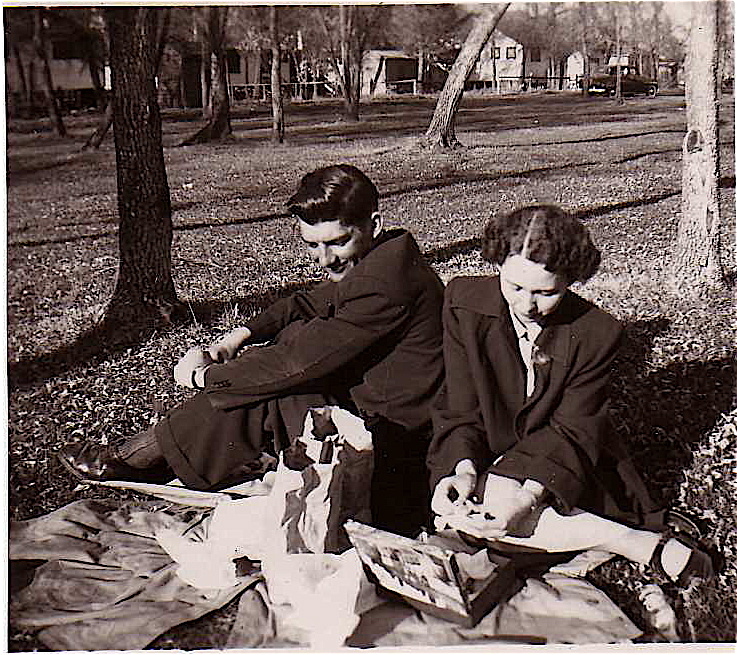 Many dates like this picnic followed. Eventually they went to each other’s homes and met one another’s families. The day they got engaged they first went to the beach with their friends. They packed a picnic lunch. That evening when they got back to Winnipeg they dropped off their friends and drove to Assiniboine Park which is where Dad proposed. He was interrupted by the park warden knocking on the window and telling them the park was closing. Dad rushed through the rest of the proposal and Mom accepted. That summer Mom was working as a nurses’ aide at a hospital in Brandon. Dad went to visit her and give her the ring he had bought at Mitchell Copp Jewelers for $125. In the evening Dad drove the car up onto a hill overlooking the river with all the lights of the city twinkling below. It was here Dad presented Mom with the ring. A year later Mom and Dad were married. 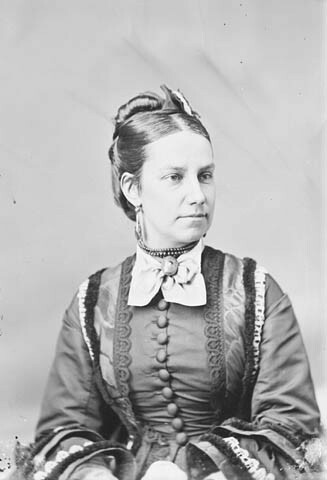 Agnes MacDonald, the wife of Canada’s first prime minister Sir John A. MacDonald spoke those words as she perched on the cowcatcher at the front of a train. In 1886 Agnes and Sir John A. were guests on the maiden journey of the new Canadian Pacific Railway to Banff, Alberta. Exasperated with seeing the splendor of the Rockies only through the glass of the train window, Agnes declared she would put a box up on the cowcatcher of the train and ride there. The train engineer was appalled and tried to dissuade her. He insisted she receive the prime minister’s permission. Sir John A apparently quite unperturbed at the prospect of his wife falling into the Fraser Canyon gave his assent. Agnes quickly enthroned herself on the box at the front of the locomotive. Later she would write the words that open this blog post in her journal. Agnes was certainly a woman with a mind of her own. Reading about her in Heather Robertson’s book More Than A Rose one gets the impression she was full of mischief and adventure before she wed the prime minister who was 21 years her senior. Witty, perceptive and energetic she found her new life in Ottawa difficult. Much younger than her husband’s friends she never fit in with his crowd. Sir John A was an alcoholic and hopelessly in debt. Ottawa was a rough frontier town at the time, not at all like London, England where Agnes was living when she met her future husband. 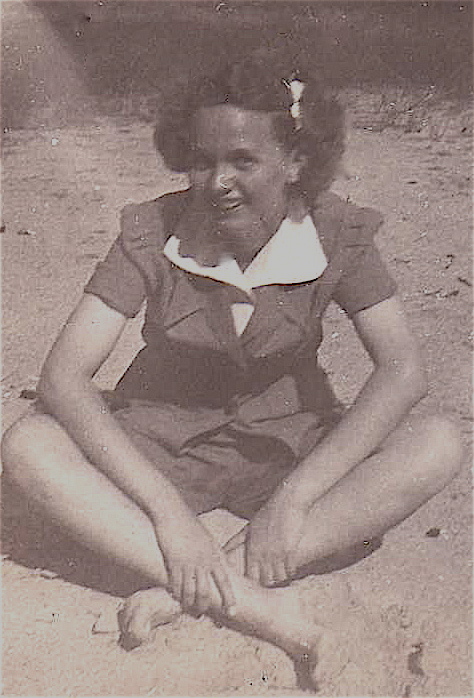 The McDonalds had only one child, a daughter Mary who had hydrocephalus and was often ill.
Perhaps Agnes’ railroad adventure was one way for her to break free from the responsibilities of a difficult family life and the clearly defined expectations the public had of her in the confining role of the prime minister’s wife. Agnes lived in a time when women weren’t offered many choices in life. They had to find small ways to assert their independence. Agnes certainly did! 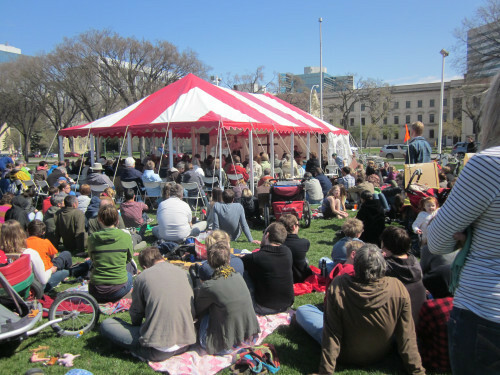 Spouting old-fashioned ‘Come to Jesus’ style gospel tent meeting patter the speakers at this morning’s Consumption Sabbath rally in Winnipeg’s Memorial Park exhorted the 300 or so people in attendance to come forward and take a stand for God’s creation. 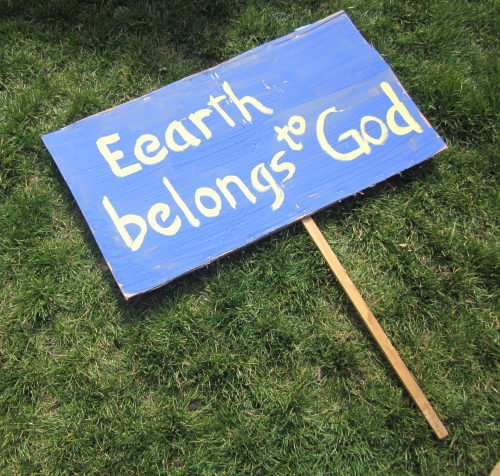 My husband Dave pedaled his bike and I walked to the Consumption Sabbath service since advertisements for the Earth Day event had encouraged attendees to leave their cars at home. 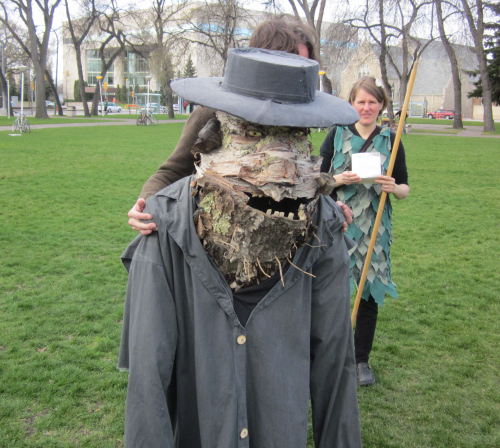 The site was littered with signs carried by the people who had participated in a walking parade through Winnipeg streets that was held just prior to the eleven o’clock service called a ‘radical revival’ . It had a format like that of some of the crusade meetings I attended as a child. There was a robe-clad choir who led us in old gospel favorites like This Little Light of Mine and Amazing Grace. The first two speakers gave testimonies describing their conversion experiences. Christine Penner Polle began her talk by acknowledging that in the past she had been a climate change avoider but since becoming a fossil fuel abolitionist she lives with much more hope. She encouraged us to be the tree not the acorn. Read about Christine’s conversion in The Canadian Mennonite. The second speaker DeLayne Toews was a fiery evangelist . The Lord had sent him to the garden to change his life and there weeding onions and watching pumpkins grow he was saved from his consumptive lifestyle. Read about the collective farm DeLayne helps to operate in this Free Press article. Annie Janzen was the third speaker, a volunteer from the audience. I know Annie since she was the cook at Canadian Mennonite University when I was a student there. She fed us so well, but also got to know us and took an interest in students’ lives. She compared God’s creation to flower bulbs that will bloom year after year if humans don’t interfere artificially with their growth cycle. 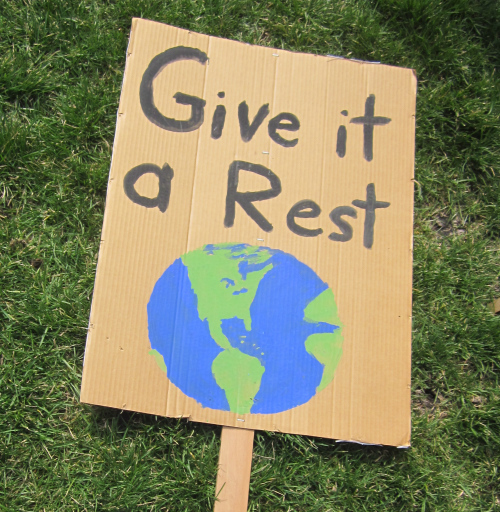 We all laughed when the elderly Annie said, “Thank you to every one who has already offered me a chair to sit on today; but it is Earth Day and I want to sit or stand on the earth.” Read more about what Annie has done since her retirement in the Canadian Mennonite article. 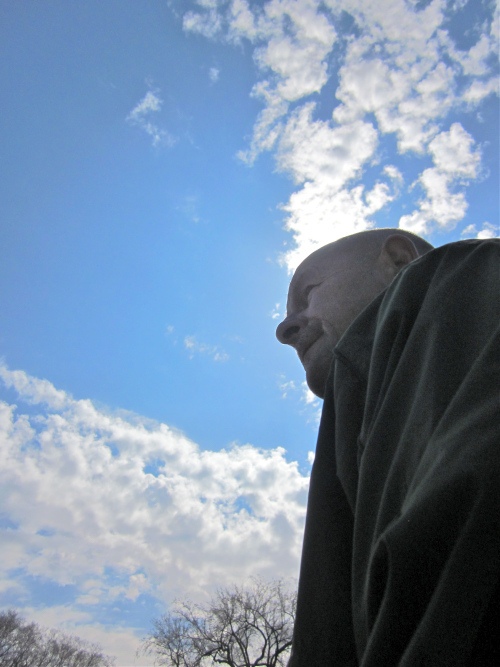 Aiden Enns, editor of Geez magazine, made reference to orators Billy Graham and Barack Obama as he adopted the persona of Brother Aiden John to preach to us about the need for a more poetic and less scientific connection to creation. He urged us to temper our enchantment with human creations like the i-phone by taking more delight in natural creations like flowers and trees. 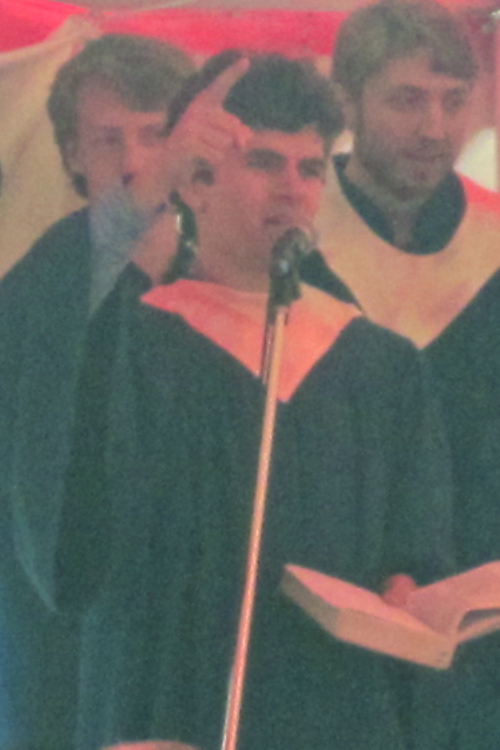 Using exaggerated gestures to emphasize his points Brother Aiden entreated us to recognize, restrain and redistribute. We had each been given a pledge card when the service started and now Brother Aiden asked us to fill it out, writing down what we were prepared to do to take a break from over -consumption like…….. take a digital sabbath- no computers for a time; take a junk food sabbath-eat locally produced food instead; or take a motorized transport sabbath-bike or walk instead. 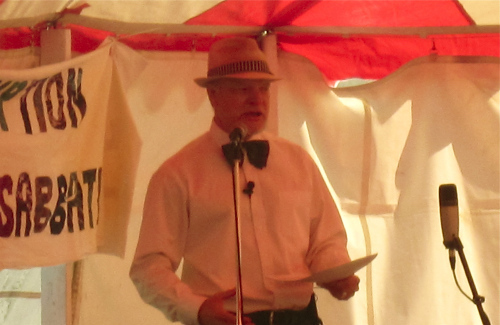 As the congregation sang we were called to come forward and tape our pledge to a large gold oil drum at the front of the tent as a symbol of our committment to take a break from over-consumption. After the service it was great to chat with the many familiar people in the crowd. 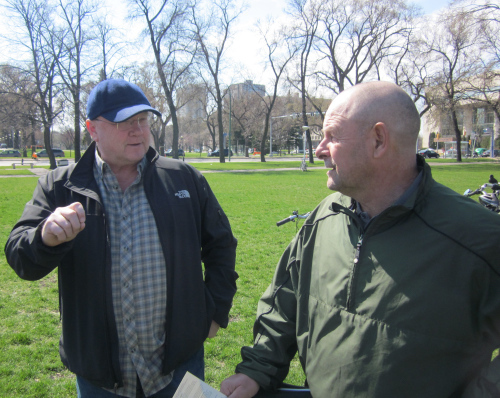 Here Dave visits with a former fellow church member of ours Charles Loewen. 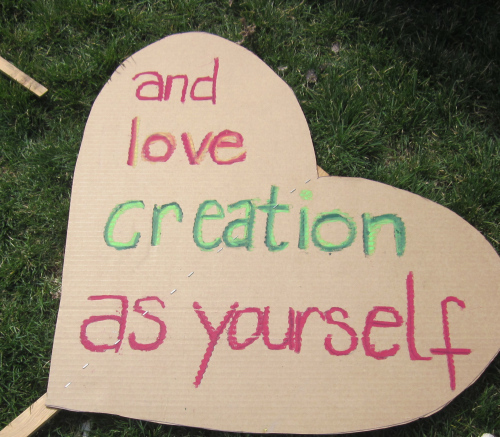 You can read more about the Consumption Sabbath in this Free Press article. What next? I’ve pledged to try to reduce my computer screen hours. Hope I will still have time to complete a blog post everyday.